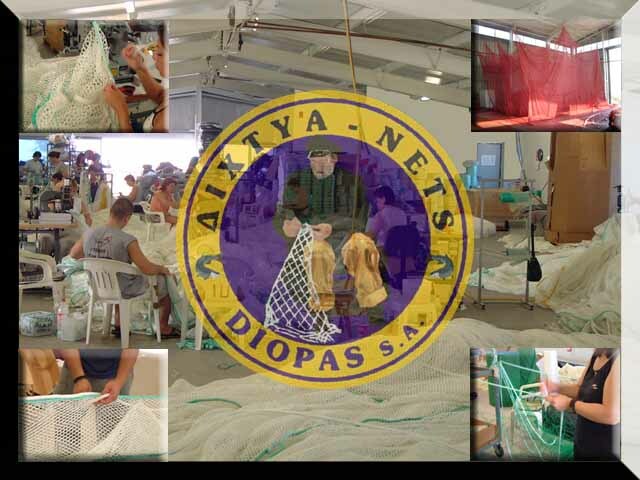 DIOPAS S.A. is a company specialized in the design, construction and processing of nets. The company has been funded in 1958 initially as a trade company in fishery materials having as main product the net. Later the company extended its activities in the construction of nets for the fishery. The rapid growth of the aquaculture sector in the beginning of the 90’s provided a unique chance for further development and the company entered in the construction of nets for the aquaculture. The company is housed in a 8.500 square meter plant in the industrial area of Mihaniona close to Thessaloniki and employs 60 people on a permanent basis. The technology that is used for the construction of nets has been developed in house and uses an extended machine park able to provide solutions to any requirement in net construction of the clients. The company holds certification ISO 9001:2000. The fishery division manufactures all kind of static nets for the small scale fishery, trawl nets for the trawlers and encircling nets for the purse seines. The nets are provided either as ready to use gears or as parts of them. The aquaculture division manufactures all kinds of nets requested by the sector but also ready to use products such as cages of any size or form, harvesting nets, shading nets and cage protection nets (protection from seagulls’ attacks). The company provides also antifouling materials and solutions in shade-shadow nets problems, shade-shadow net repairs etc. The terrestrial applications division manufactures all kind of nets for sport fields, safety nets, shading nets, wind shield nets, insect and bird protection nets.